As in the 1965 Indo-Pak War, the main battles in 1971 between armoured formations was relegated to Chamb and Shakargarh sectors - located in the Western Theatre. 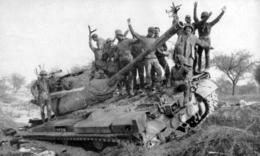 Sporadic tank battles took place in the East Theatre, but these were one-sided battles weighed heavily in India's favour. No action had taken place in the Punjab sector, but the South-Western sector in Rajasthan did see much activity. An offensive by the Pakistanis was blunted here solely on the use of air power. The Indian Army had two armoured regiments and three independent armoured squadrons supporting Lieutenant General Jagjit Singh Aurora's Eastern Command's thrust into East Pakistan. India had one T-55 tank regiment in the northern sector supporting the XXXIII Corps' offensive in the Hilli-Bogra area, with one PT-76 regiment in the western area supporting the II Corps' thrust. Finally three independent armoured squadrons (one PT-76, one AMX-13 and one Ferret armoured car) were supporting the IV Corps' offensive from the east. Opposing them were a Pakistani armoured force of a regiment of M-24 Chafees in the Bogra area, countering India's T-55 regiment and two squadrons of Chafeee tanks supporting the west and Dacca sectors. 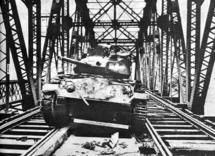 When full scale hostilities began, half the tanks were either knocked out or captured by the time the Indian troops were on the outskirts of Dacca. 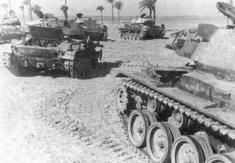 After which the rest of the tanks were finally accounted for, as part of the surrender deal. In it's offensive, Indian losses were heavy. At least thirty PT-76 tanks were destroyed or damaged, another four T-55s had their tracks blown up over mines. The high loss rate among the PT-76 tanks was due to the fact that this type of tank had very thin armour plating to help assist its amphibious capabilities and was an easy target for mines. However all, but eleven, of the PT-76s were repaired after the war. The AMX-13s did not see much action and the Ferrets had no battle casualties. One very interesting situation, had the tank squadron of the 7th Light Cavalry recovering one of their own tanks lost to the Pakistan Army during the 1965 War, which was displayed at the East Bengal Regimental Center as a war trophy. 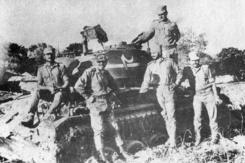 The tank was then handed to the Army Ordnance Corps, which in turn handed it back to the East Bengal Regimental Center! The Battle of Basantar took place during the 1 Corps' offensive in the Shakargarh Sector. 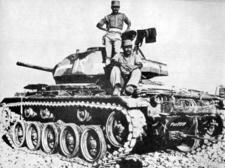 India employed two armoured brigades to support its offensive by three infantry divisions and the Pakistani reaction was swift. On December 16th and 17th, when Indian infantry captured certain villages at the River Basantar, Pakistan sent in an armoured brigade. 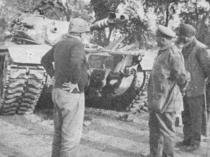 The 17 Poona Horse equipped with the Centurion tank, blunted the Pakistani armoured offensive. One particular action at Barapind saw one lone tank troop (three tanks) of the 17 Poona Horse - Indian Army take on an entire squadron of Pattons of the 13th Cavalry - Pakistan Army. When one of the tanks was hit & disabled and another tank's gun was jammed, the troop commander, Captain V Malhotra gave the order for the last remaining tank to withdraw. 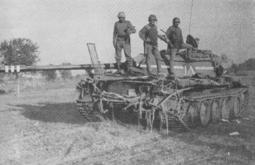 But this tank led by Second Lieutenant Arun Khetarpal, stuck to its position and kept firing at the Pattons till the last moment when Second Lieutenant Khetarpal was hit and killed. These three tanks accounted for more than the ten tanks out of the squadron. So impressed were the Pakistanis with this action, that the Squadron Commander of Pakistan's 13 Cavalry - Major Nissar came over to the Indian lines after the ceasefire to talk to the tank commanders who had blunted his offensive. At the end of which, 66 Pakistani tanks were claimed as destroyed. Indian casualties were about 23 tanks, however the efforts of the EME (Electrical & Mechanical Engineers) saw to that all, but 10 of the tanks, were back on the road again. The Hindi movie BORDER has immortalised the Battle of Longewala, in which a company of infantry troops with two RCL guns, held at bay an entire Pakistani armoured regiment, till four IAF Hunters from the nearby airbase of Jaisalmer came and wreaked havoc with the Pakistani tanks. The Pakistan Army had a T-59 regiment sent in an offensive, to occupy Ramgarh. A bold and clever plan, but suffered from the lack of boldness on the commanders in the field. The Hunters from Jaisalmer took a toll on the Pakistani tanks. 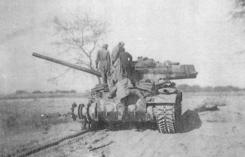 Later on, Indian troops following on the heels of the fleeing Pakistan Army recovered more tanks. Indian losses in this sector were seven T-55s and one AMX-13. Other battles took place in Chamb and in Hussainiwala, Fazilka. Five damaged / unserviceable T-59 tanks were recovered at Chamb. One of the T-59s of Pakistan's 28 Cavalry was also recovered intact. Once again, this tank was lying abandoned in no-man's land when Indian Army personnel recovered it under severe enemy firing. India claimed to have destroyed over 30 Pakistani tanks in this sector, while its own losses were also high. 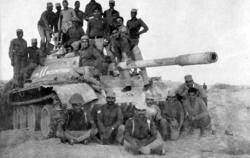 Eighteen T-55 tanks from the Deccan Horse armoured regiment became battle casualties. At the end of the war, India had claimed the destruction or capture of 226 Pakistani tanks. As explained, more than 110 tanks were in Indian hands. Indian casualties on the other hand were minimal at 81 tanks. It is believed not more than 20 tanks were in Pakistani hands. Copyright BHARAT RAKSHAK. All rights reserved.Reproduction in whole or in part in any form or medium without express written permission of BHARAT RAKSHAK is prohibited.